Needle-wielding pet owners won't be able to resist this adorable collection of projects for their favorite four-legged friends. Showcasing the work of major designers, it branches out from the ubiquitous sweater for Fido by offering original toys, collars, carrying cases, and, yes plenty of wearable items for animals both big and small. A deluxe doggie bed with a beautiful Fair Isle pattern incorporates dog bones and paw prints. A cute birdcage cover features colorful variegated yarn. A chichi handbag shaped like a puppy is perfect for carrying a small dog. 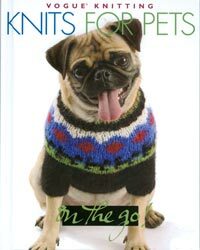 Easy-to-follow instructions and crisp phots accompany each pattern, ensuring every knitter will be able to join in the pampering.